How does the Delta of a lookback option behave? What is Cross-Gamma? Is the Vega of a digital option ever negative? And furthermore, how do these exotic greeks (“greexotics) evolve as time passes and implied volatility changes? In this series of articles, we would like to give the reader a brief but comprehensive answer to the questions above (and many more). If someone feels the need of a refresh (or even an introduction to) higher order greeks, we kindly advise you to have a look at our previous article on this topic, available at http://www.bsic.it/guide-land-higher-order-greeks/ – for a broader explanation of the Black-Scholes-Merton model and its implementation in VBA we encourage you to visit http://www.bsic.it/black-scholes-model-vba/ . In our analysis, we will deal mostly with the three most important greeks: Delta, Gamma, Vega and their evolution as other parameters change. We will not cover, if not briefly, Theta and Rho because they are the greeks that depends the most on contract specification, for instance the rho is completely different depending on whether the premium is paid upfront or at maturity. In addition to this, they are usually the two greeks traders care the least about: the time passage is not really something incredibly unexpected and the interest rate is far from being the core of the hedging activity carried out by traders (unless, of course, the underlying itself is the interest rate). In this first article of the series we would like to introduce binary (or digital) options and their first and second order greeks. Binary (or digital) options pay a fixed sum if they expire in-the-money and, as any other options, they pay zero if they expire out-of-the money; therefore, their payoff at expiry is discontinuous in the underlying asset price. For instance, a binary call option contract pays $1 at expiry, time T, if the asset price is then greater than the strike price, K. Why would you invest in a binary call? If you think that the asset price will rise by expiry, to finish above the strike price, then you might choose to buy either a vanilla call or a binary call. 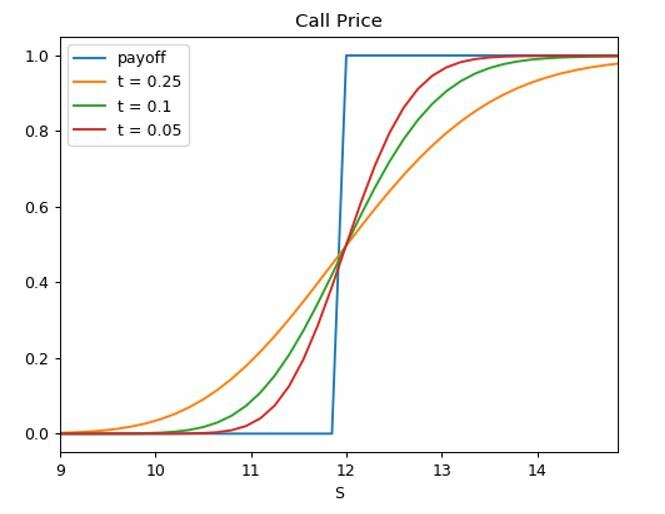 The difference is that the binary call can never pay off more than the fixed sum, $1 in our example. If you believe that the asset rise will be less dramatic then you may buy the binary call. The gearing of the vanilla call is greater than that for a binary call if the move in the underlying is large. Where Q is the fixed amount that the option would pay at maturity if in the money. The value of a European digital is therefore capped between 0 and Q, for any positive level of the interest rate; as the time to maturity, represented by t in all our charts, decreases the function of market value of the digital option with respect to moneyness becomes increasingly more “steep” – this is because, as maturity approaches, the function of the price of the binary has to approach the function of the payoff, which is discontinuous for S = K (ie, at-the-money), as shown in the chart below. In order to examine the greeks, we will consider the same contract (a simple European digital call with strike price K = 12 and Q =1 and premium paid upfront). In our charts, S represent the forward price today. We use the underlying forward price rather than the underlying spot price to make comparison easier across different times to maturity (recall that, under the risk neutral measure, the expected drift in the forward price is zero whilst this is not the case with the spot price). One feature that should be kept in mind is that, whilst digital options are usually European, in the presence of an American digital option the early exercise would always be optimal (provided that r > 0). This implies that the option would be exercised immediately after the underlying price rises above the exercise price; this happens for two reasons: first of all, the maximum P&L of the position is capped at (Q – premium) and therefore any further increase in the underlying price would not give the holder of the digital American any benefit (actually, if anything, with positive interest rate the PV of the premium paid upfront increases as time passes and thus the P&L would decrease); second, for any positive interest rate, the sooner the holder of the option receives the fixed amount Q, the better it is because it can reinvest Q at the riskless rate. Another, even more intuitive thought is that holding an ITM digital cannot provide any benefit in terms of additional payoff but it can still fall back in the OTM territory and thus expire worthless. Before introducing the greeks of a European binary option it is important to note how a digital can be somehow replicated as a combination of long (usually at-the-money) calls and short out-of-the-money calls. In fact, we can approximate a digital option as a bull spread strategy “taken to the extreme”. 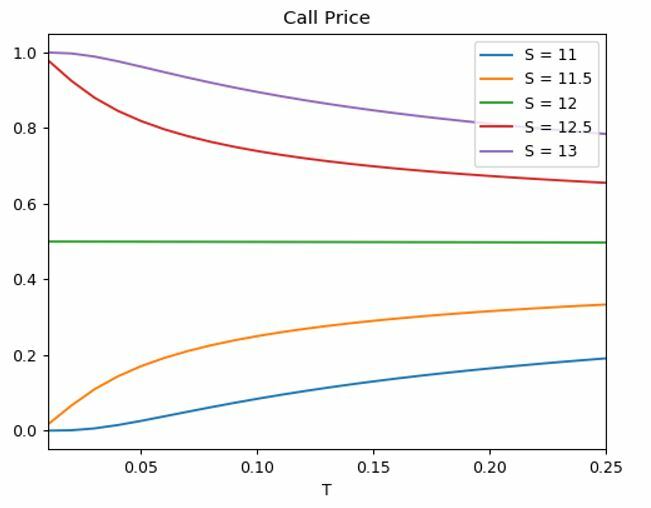 If there were no transaction costs and any quantity of options with any strike could be traded, we could simply build a digital option by buying N options with strike price K and sell the same number of options (N) with strike price K+ε with ε extremely small – in this way as soon as the price goes above K (and K+ε), the strategy would have a payoff equal to ε times N. Given a certain ε, it would be therefore sufficient to buy and sell a number of contracts N such that ε * N = Q with Q being the desired fixed payoff of the “synthetic” digital option. Whilst the replication strategy outlined above cannot be put in practice in reality, having in mind that a digital option can be seen as a combination of long and short call options, can be useful to better understand the greeks associated to this “exotic” contract – for instance, it can help us to understand how an holder of a long position in a European digital option can be Gamma negative when the option is in-the-money. 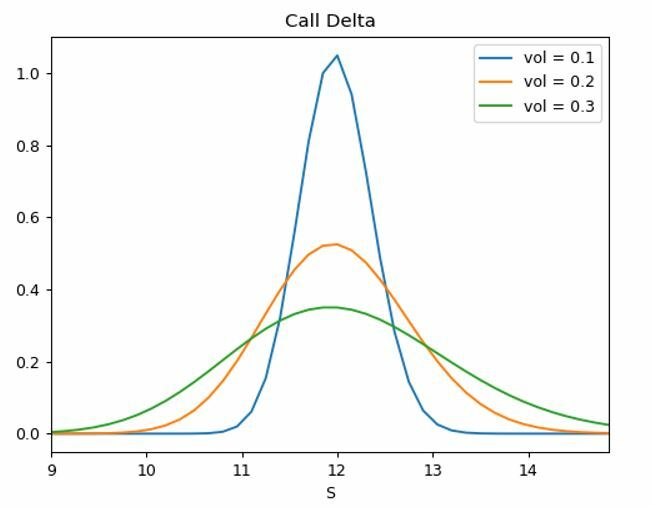 The main difference shown in the delta of a digital call compared to the one of a vanilla call is that when the option is deep in-the-money the delta will be close to 0 from above rather than close to 1 from below as for vanilla calls. Intuitively, this should be attributed to the fact that, once the price is sufficiently greater than the strike, because of the fixed payoff at maturity, the holder is pretty much indifferent to a further movement in the underlying price, especially if positive. Of course, the delta will move closer and closer to 0 as the time to maturity decreases for both deep in-the-money and deep out-of-the-money options. For options close to be ATM the delta increases as time passes, i.e. as t becomes smaller, and, if we could chart the delta exactly one instant before maturity we would see that it takes the value of plus infinity, i.e. on the expiry the delta has a discontinuity point in S = K.
It is interesting to note that, for some levels of the price of the underlying, the derivative of the delta with respect to changes in the time to maturity is non-monotonic – for instance, in our simulation with K = 12, if the price of the underlying is approximately 11.10, the delta increases when the time to maturity changes from 0.25 to 0.1 but then it drops when the time to maturity decreases from 0.1 to 0.05 – this tells us that the sign of derivative of the delta with respect to time depends not only on the moneyness of the option but, at least for some levels of the underlying price, but also on how large is the time to maturity. Overall, the magnitude of the time decay in the Delta is a function, that can be either positive or negative, of the time to maturity. The chart above confirms our intuition regarding the dependence of the change in the Delta caused by the passage of time: for prices of the underlying marginally ITM and OTM, i.e. 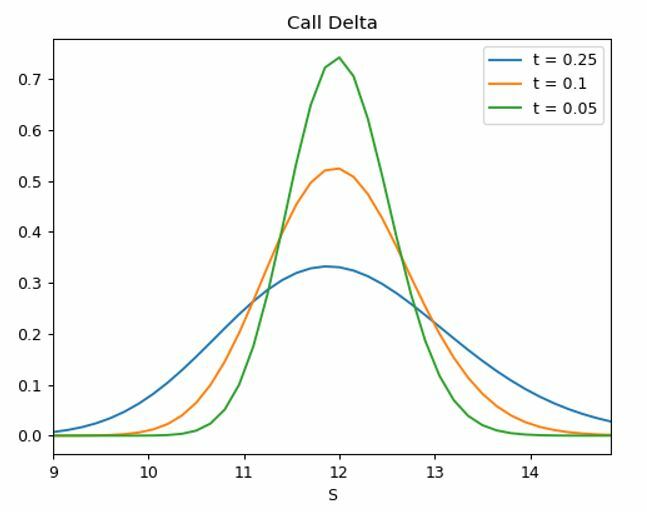 prices equal to 11.5 or 12.5 (orange and red line), the Delta increases as time to maturity decreases from 0.20 to 0.15 but it decreases when the time to maturity becomes smaller than 0.05; this is not true for deep ITM and deep OTM options, nor for the always ATM option ( S = K = 12 ). In greeks jargon we could say that the Charm, also known as “Delta bleed”, that is, the change in Delta for a small change in time to maturity, is a non-monotonic function of time and moneyness which can take both positive and negative values. However, we can generalize a bit and say that for deep out-of-the money and deep in-the-money digital options it is always negative. It is always positive for ATM options whilst it can be either positive or negative depending on the time to maturity for slightly ITM and OTM options. Almost the same can be said for the evolution of the Delta with respect to changes in the implied volatility IV; a decrease in implied volatility pushes the delta closer to 0 for deep ITM and deep OTM options, it has a mixed effect on slighlty ITM and OTM options. On the other hand, for options sufficiently close to be ATM, a decrease in the volatility has a positive impact on the delta – in other words, the Vanna, that is, the change in the Delta for a change in IV, can be both positive or negative depending on the moneyness of the option and, at least for some level of moneyness, on the absolute level of implied volatility; for instance, when the underlying price is close to 11.10 and the volatility is 0.3 the Vanna is negative (decreasing volatility would lead to a higher Delta) whilst if the volatility were 0.2 the Vanna would be positive (decreasing volatility would push down the Delta). For deep ITM and OTM option, however, the Vanna is positive (decreasing volatility leads to lower Delta); for options sufficiently close to be ATM it is always negative (a decrease in implied volatility causes a rise in the Delta). 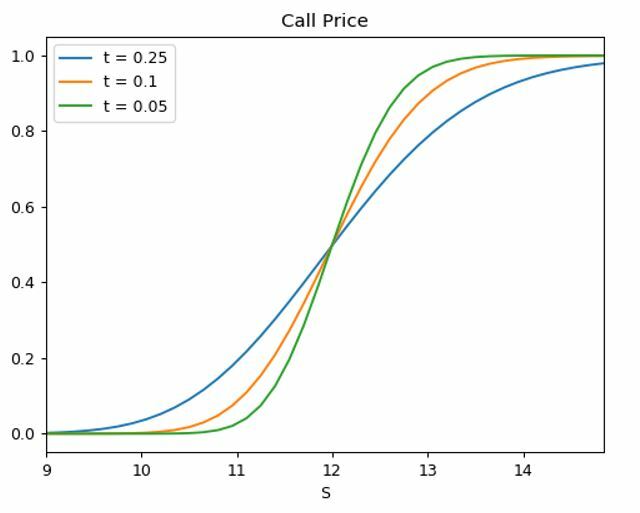 As we have seen, for any value of time to maturity and implied volatility, the Delta of a digital call option increases as the prices the underlying increases until it reaches S = K, ie. the ATM point, then Delta decreases for further increases in the price of the underlying. In other words, the delta is an increasing function of moneyness as long as the underlying price is lower than the strike price, i.e. the option is out of the money, and then it starts to decrease as soon as S > K, i.e. as soon as the digital call gets in the money. This intuitively tells us that the Gamma can be both positive and negative depending on the moneyness and that there is a point in which it must be equal to zero (mathematically this also be inferred by a simple application of Roll’s theorem: since Delta(deep ITM) = Delta(deep OTM) then there must be at least one point (or an odd number of points) where ΔDelta’(S), i.e. the derivative of the Delta with respect to the underlying price, that is, Gamma, is 0. If one is accustomed with vanilla options only, it may sound weird to think of being long a call and, at the same time, be Gamma negative. However, as suggested in the introduction, two statements should be kept in mind: first of all, as a general rule, exotics greeks can be fairly different (even counterintuitive) with respect to vanilla options greeks because of their very nature; second, specifically for binary options, it is worth stressing that a digital can viewed as an “extreme” bull call spread. 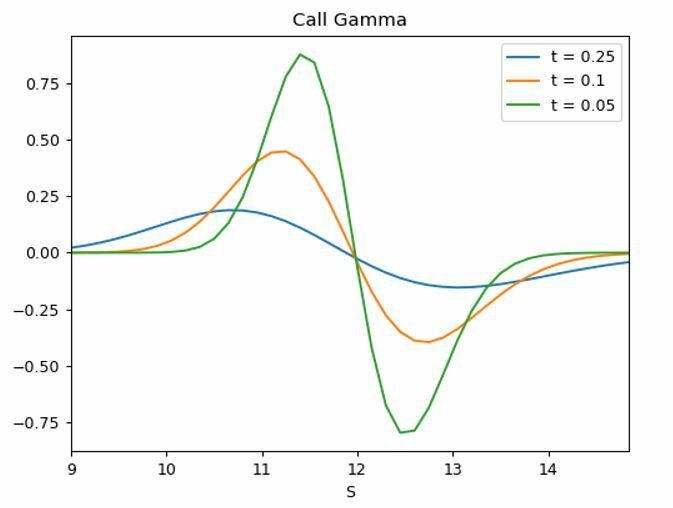 As in the bull call spread, therefore, when the strategy is deep in the money the dominant effect on gamma comes from the short rather than the long call (because it is the one closest to be ATM). One additional way to look at this is to look at the price chart of the digital option: as it gets deeper in the money or deeper out of the money, the delta (the slope of the function) has to drop to 0 as the option value must be bounded between 0 and Q. 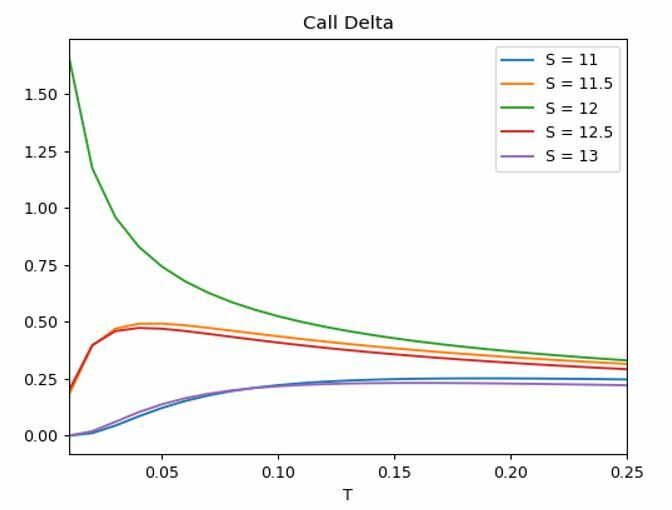 Since the curvature of the Delta decreases as time passes for (deep) OTM and ITM options whilst it increases for ATM or close-to-be-ATM options, the Color, i.e. change in Gamma for a small change in time, can be both positive or negative depending on the moneyness of the option and, for the same level of moneyness, its sign can vary depending on the time to maturity. 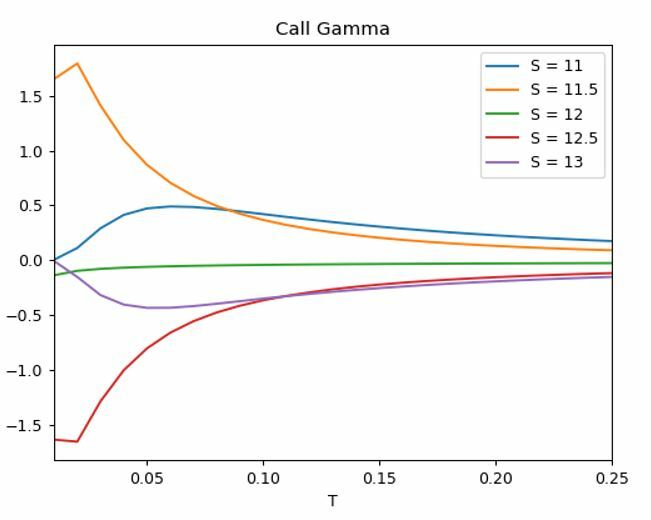 However, Color behaviour is at odds with the behaviour of the Charm mentioned before: for a slightly ITM option, the passage of time pushes the Gamma to be more and more negative, whilst the decrease in time to maturity cause a steep increase in a slightly OTM digital call. For deep ITM and deep OTM options however, no general statement can be made. For instance, as shown by the following chart, in our simulations the effect of time passage on Gamma is always negative for an option with 80% or 120% moneyness but the same cannot be said for the same digital when the moneyness is equal to 85% or 115% – nor the sign in the change in the Gamma with respect to time can be defined as function of the distance from the ATM point. And how about the change in the Gamma with respect to changes in the underlying price? In other words, how about the Speed of the binary option? Since our Gamma peaks immediately before and after the at-the-money point, we can simply say that the speed is positive for deep OTM option until the Gamma peaks positively in a left round of S = K; then it becomes deeply negative until Gamma switches from positive to negative and shows another peak, this time on a negative value, on a right round of S = K. After this peak, as the gamma must approach zero from below for deep ITM digital calls, the Speed becomes positive again. Note that the peak of Gamma is closer to the ATM point the lower the time to maturity – in other words, the distance between S = K and the point in which Gamma peaks (i.e., where it shows a maximum/minimum value) is a positive function of the time to maturity: the lower the time to maturity the closer the peak to the ATM point. 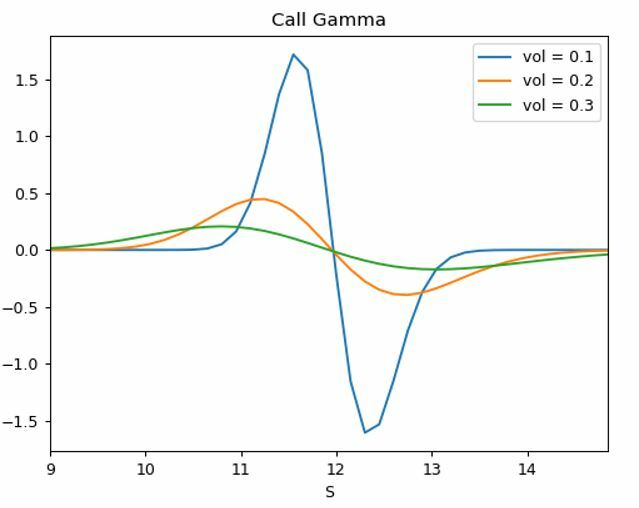 Changes in Gamma can be also triggered by changes in the implied volatility IV. The change in Gamma as a reaction of changes in the implied volatility is called Zomma; Zomma is positive for deep OTM options and for slightly ITM options, whilst it is negative sign for deep ITM option and slightly OTM options. As shown in the chart above the sign of Zomma is therefore a function of the moneyness and, for some level of moneyness, it depends on the absolute level of the implied volatility. Therefore, no general statement can be made for not-so-deep In and Out the Money options – i.e. the sign of the Zomma in S = 10.75 is different between a change in IV from 10% to 20% and a change in IV from 20% to 30%. How would the price of our option chang as a result of a change in the implied volatility, IV? Intuitively, we can arrive to this conclusion: if the option is OTM we would like to have an increase in volatility because it increases the probability of the option to get ITM, ceteris paribus. More formally, an increase in the IV leads to higher prices for vanilla calls and puts, irrespectively of the moneyness. 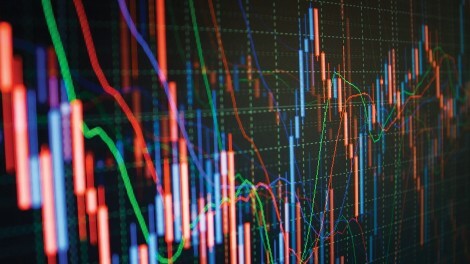 Recalling that our digital can be theoretically viewed as a combination of long and short positions in vanilla calls, it is easy to understand that, when the long calls position dominates the short calls position, the impact of an increase in IV would be the same as the one of a simple call, i.e. a rise in volatility would have a positive effect in the price of our digital. The Vega of a digital must therefore be positive when the option is OTM. However, as soon as the underlying price rises above K and the digital becomes ITM, then there is no upside from an increase in volatility – actually, the opposite happens: since it makes no difference on the payoff whether the option expires with 105% or 200% moneyness, in light of an increase in volatility, the holder of a ITM digital would be more concerned with the possibility of the price to fall again below the strike. To put it differently, an increase in the volatility makes larger changes in the underlying more likely. If we are ITM, the payoff at expiry will not change if a positive large change in the underlying price happens: it will always be Q; but an increase in volatility makes also negative moves in the underlying price more likely: therefore it is more likely that the option will fall back in the OTM territory. From our bull call spread analogy instead we can say that when the digital is ITM the dominant component comes from the short calls position and therefore, as any vanilla options writer, we do not like volatility to go up. Both these two intuitions lead to the same result: the Vega of a digital must be positive when the option is OTM and negative when the option is ITM. 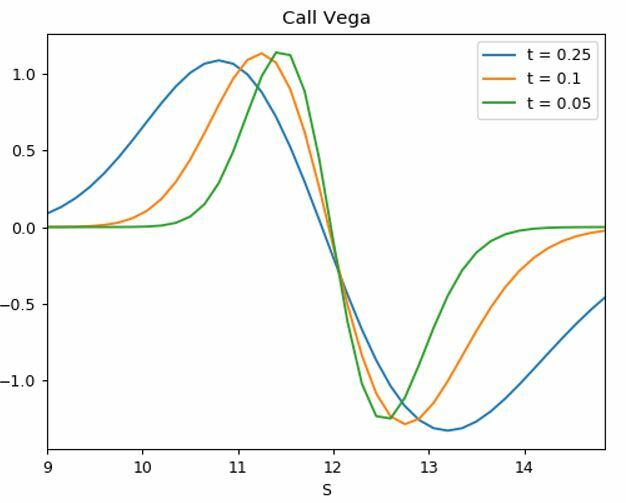 The Vega of an ATM digital should always be close to zero as there is no dominant component among the long and the short call. So far, we have assessed that Vega is positive for S<K and negative for S>K. 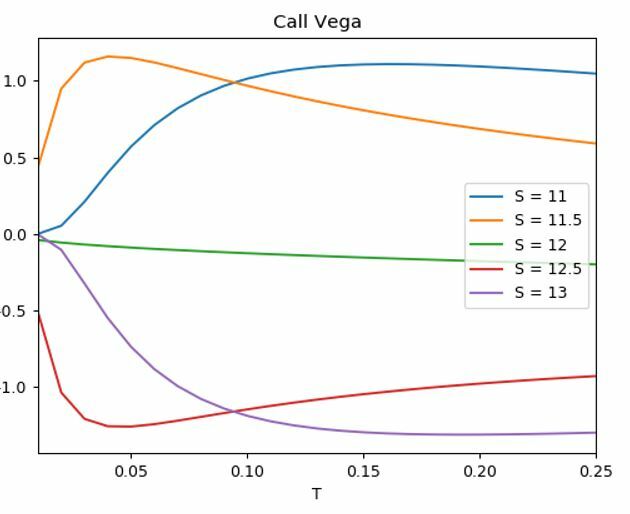 Can Vega be monotonic? Of course not: if we are deep out-of-the-money, a rise in implied volatility is less important than if we were close to be ATM: the Vega must increase as the option becomes less out-of-the-money. But we also said that the Vega must be zero when the option is ATM. Therefore, there must be a peak of the Vega, i.e. a point in which the Vega stop to increase and it starts to decrease as the underlying price increases. Symmetrically, the same can be said for ITM digital options: when we are close to be ATM, i.e. the option is just slightly ITM, we are more concerned by a rise in the (implied) volatility of the underlying compared to when we are deep ITM. In fact, the Vega approaches zero from below when the digital is deep in-the-money. Since the Vega is 0 at-the-money then negative (as the holder is unhappy of a rise in volatility) and then again close to zero from below, there must be a peak, i.e. a point where the derivative of Vega with respect to the moneyness is 0. 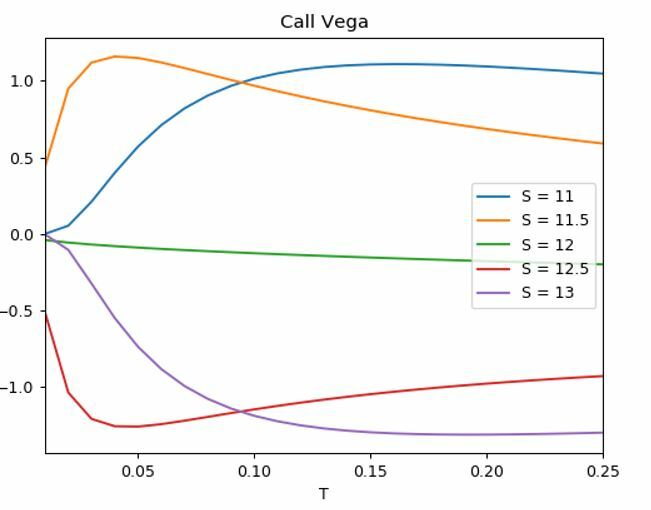 How does this wry theorem have an impact on our discussion about Vega and its derivatives? 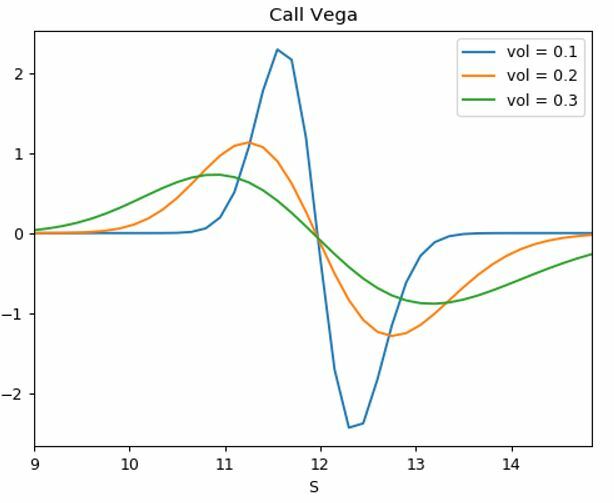 Well, practically speaking, the change in the Vega (which is in itself a derivative of the market value of the option) with respect to the underlying price is simply the same as the change in the Delta (which is also a derivative of the option price) with respect to change in the implied volatility. Does this sound familiar? Of course it does, as before we introduced the Vanna, that is the greek that represents the change in the Delta for a change in IV. Now, we can also say that the Vanna is the derivative of Vega as the underlying price changes. Finally, from looking again at the chart above we can see an example that confirms our intuition regarding the nature of Vanna and the fact that it can take both positive and negative values; for instance, when t = 0.20 an increase in the underlying price pushes down the Vega, i.e. we have a negative Vanna, whilst when t = 0.05 an increase in the underlying price has mixed effect on the Vega, i.e. the Vanna can be both positive and negative depending on the level of the moneyness. How would Vega change as time passes? Again, intuition here is sufficient to get a grasp of the matter. Recalling that Vega is the change in the price of the digital as a function of changes in IV. Would the holder of the digital be more happy or concerned if the change in the IV happened immediately before maturity or when the option had just been issued? The longer the time to maturity the more time the holder has to be affected (both positively if OTM or negatively if ITM) by the change in the volatility. For the same level of moneyness, we could say that having a greater time to maturity leads to a higher Vega. Is this true for all the levels of the underlying price? Not really. When the option is sufficiently close to be at-the-money, the option would show a higher Vega the lower the time to maturity. The greek that shows the relation between Vega and time is called Veta. Veta, therefore, is the change in Vega for a small change in time or, equivalently from the theorem outlined above, the change in Theta for a small change in IV. How is it possible that for some moneyness the time decay leads to a higher (in absolute value) Vega? Analytically, this can be justified by saying that the derivative of Veta with respect to the moneyness is a non-monotonic function of the time to maturity. How about the “Vega convexity” of the digital? This is represented by the Vomma, also known as Volga. It is the change in Vega for a small change in IV. It is positive for deep ITM and deep OTM options, it shows a peak immediately before and after the ATM point and, as the Charm and other greeks that we presented in this article, it can have a different behaviour for some moneyness depending on the absolute level of the implied volatility. After having seen so many greeks which show peaks it is worth asking where do these peaks comes from? Their existence can be easily understood when we remind ourselves of the “rough approximation” of the digital option as a bull call spread.